I’ve been dying to make cookies using this tulip-shaped cutter we’ve had in our supplies for a while now. 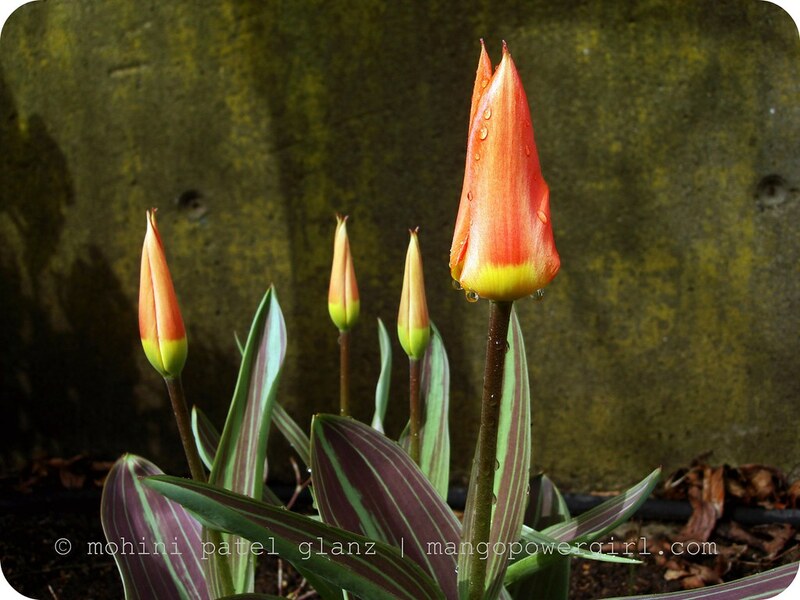 As soon as I saw the first tulip in my yard, I finally did it. Shortbread is one of those cookies that I love to eat, but never thought of baking. Recently I was going through a cookbook I received for my birthday last year and discovered a simple shortbread recipe. These cookies are my adaptation of a recipe from Nancy Silverton’s Pastries from the La Brea Bakery. With this I want to prove you can have beautiful food colors from totally natural ingredients. I will publish more posts in the future with more colors and flavors. Spring Saffron Shortbread deserves its very own alongside the lovely tulips from our yard! Saffron provides the beautiful yellowish-orange color and gives your food the most amazing aroma. This combination of flavors was very much inspired by the Indian sweets I grew up eating. I added a bit of powdered almonds and pistachios, and the flavor was out of this world. These are soft, buttery, aromatic cookies with a salty bite — as a good shortbread should have. 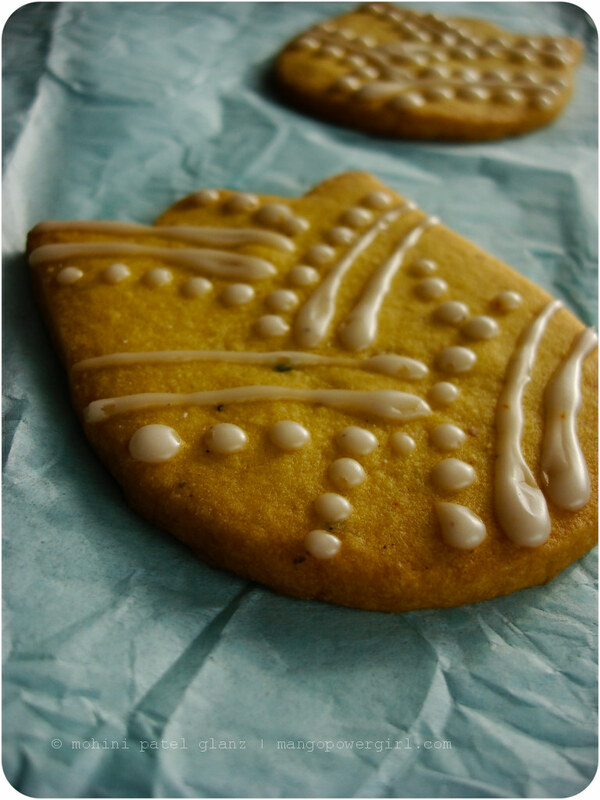 They are decorated with a saffron cardamom icing. Free Tibet & Peace to the Monks! 1. Cream the butter and salt for a couple minutes with a mixer. 2. Add the sugars and cream till the butter is soft and fluffy. 3. Add the sifted flour in a few different parts, mixing on low till all is combined. 4. Take a pinch of saffron in milk, and combine (mortar & pestle works the best here) till no strands are left; you’ll have a nice orange liquid — that is your natural food color! Add it to the cookie mix and mix till the color combines evenly. 5. Flatten the dough into a disc shape, wrap it air-tight in a plastic wrap, and chill for a couple hours. 6. Preheat the oven to 350 F (175 C) when ready. 7. Take the dough out 5 minutes before you want to roll it out. 8. Roll the dough out into a 1/2″ thick sheet on a floured surface, and cut into it whatever shapes you like. 9. Place cut outs onto a baking sheet and bake for about 10 to 12 minutes, or until you see their edges starting to brown. 10. These cookies stay pretty light in color, so once the edges are done, take them out and cool. 11. Make the icing while your cookies cool. Combine sugar, water, cardamom, and saffron in a bowl, or directly in the Ziploc® as you prefer. I crushed the saffron with my hand, but did not melt it this time so I would see little specks of saffron in the icing! 12. Cut a tiny hole at an angle on one of the tips of the icing bag, and make sure there is no air before you close the bag. Once the cookies cool, decorate away, and enjoy! This is a very colourful and creative way to enjoy shortbread MPG. I realy love the colour of the saffron. And I am in total agreement with you in regards to Tibet…I love the fact that you are actively involved and encourage others to do so as well! Saffron was a very nice and unexpected touch. Shortbread are my all time favorite cookie. I love that they are not very sweet and are tender and delicate. It would be the coup of the century if you got a photo of the Dalai Lama eating a box of your lovely cookies! You’ve taken shortbread to a whole new level, sweetie! These are beautiful. how intriguing. I have never tried saffron before, and always thought that it’s only used in savory dishes! I need to get hold of some saffron to try your shortbread recipes. Peter G – Thanks a lot! I was trying to make shortbread more interesting 🙂 And, yes it is sad what is going on in Tibet, and Dalai Lama’s message yesterday was very clear – he is not anti-Chinese, he just wants peace for his people and the world!Lisarene – Yes, these have a great salty bite to them, but addition of saffron also make cookies smell sweeter than they actually are.Peter M – I laughing died when I saw your comment 🙂 I did not have enough time to back so many, but it would’ve been a great idea to take my cookies and serve to the crowd instead of stadium food. I am not sure if it would’ve gotten to the Lama as the security was really tight. He is a very funny man, if he would’ve posed with my cookies, it would have been my shot of the century :)Patricia – I hit the mark then ;)Thanks! !Mandy – Saffron is very common in Indian sweets, but it is always used in a tiny amount. Try flavoring some of your favorite desserts with it, just don’t use too much. These are soooo pretty. The tulips , the cookies , the icing are all so perfect! The cookie cutter is new for me! I want one of those too! I have just sent you an Excellent Rating. hey, you might already have it, but I didn’t see it on your blog. If you need the badge jpg, grab it off my site. dunno which are more gorgeous, the cookies or the tulips. They are such a wonderful orange colour ! love how you’ve decorated the cookies …hehe almost like mehendi.a wonderful colour for a wonderful cause. I too hope that everything gets sorted out with the Chinese and Tibetans. Its a shame the Olympics have to suffer due to this. How absolutely beautiful! Bring on Spring (even if we’ve only had one warm day to date!)!! I love the idea of the unexpected aspect of saffron–lovely and with a message of newness and peace, it would make the Dalai Lama proud! :-)P.S. were you by chance in Lower Queen Anne early this evening (thurs.)? Yes, I am a stalker. Kajal – Thanks!! Finally, someone figured out that I was working out some mehendi like patterns. I have done a lot of henna on people (and I love to draw! ), so it was fun to replicate some similar designs on cookies. Yes you can only hope for the best for the Tibetans!Dwiana P – Thank you for stopping by! I hope you try it out. It is very easy & it tastes great.Cakespy – LoL Stalker! No, I wasn’t in Queen Anne, but that reminds me I need to go there. Thank you Thank you on the cookies, I wish I could’ve given them to the Lama. Can we please have more hot days…I can’t believe they are predicting snow!! 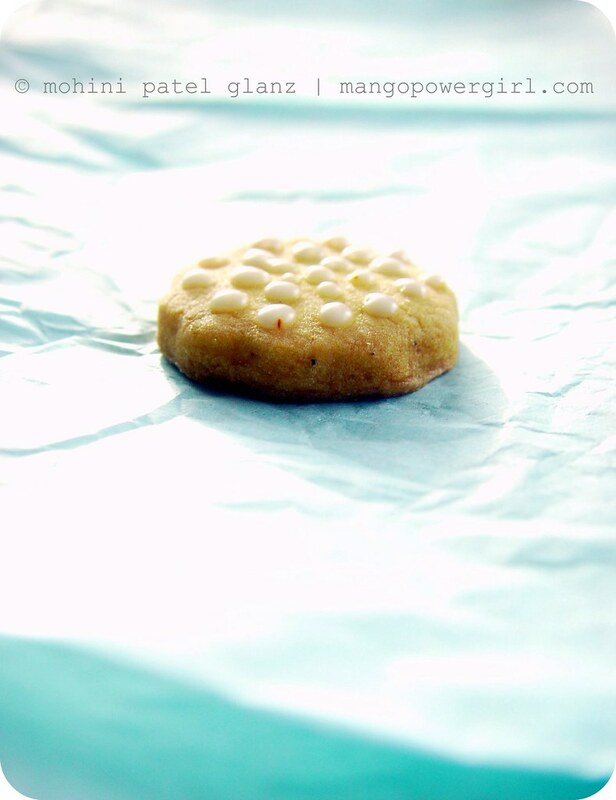 Just stumbled upon your blog and love the sound of these cookies. 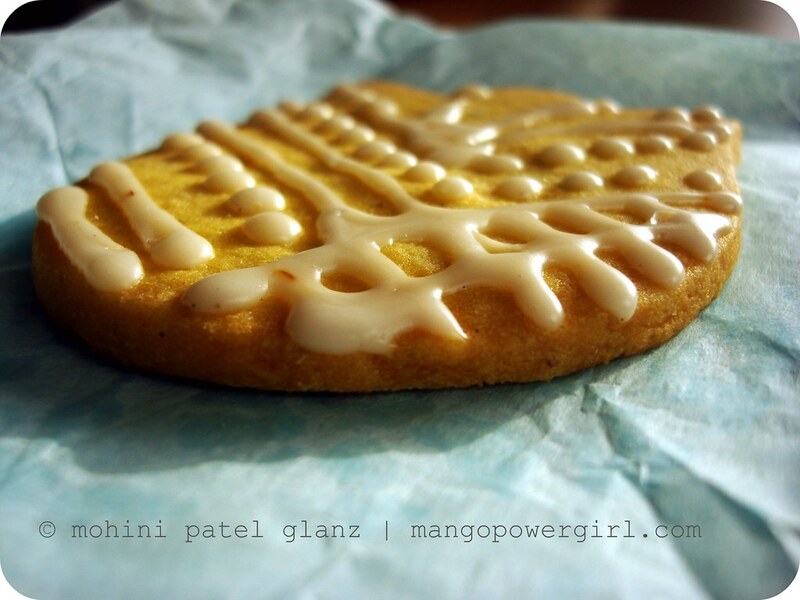 I just posted a more sugar cookie-base saffron cookie myself! I think I’ll have to try this shortbread version for sure. Jennifer – Thank you! I liked your combination as well :)Margot – Thanks! You’re so nice!! These are wonderful! I was looking for cookies that have an Indian touch but are not too unfamiliar for an American friend- these are perfect! Off to make them now..thank you.